“My exposure to juxtaposition cultures, from Korea to Saudi Arabia, have shaped me into a vibrant, adaptable and tolerant personality,” writes Rahim Munir, PhD student at KAUST on his personal website. Rahim continues: “This blog will help me and readers to use culturally and scientifically emanant curiosity to explore and think more about actual realities of life.” Olle Bergman from Crastina got in touch for some questions. 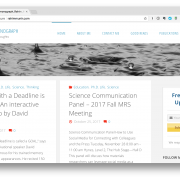 The Crastina theme of November–December 2017 is “the scientist’s personal website”. 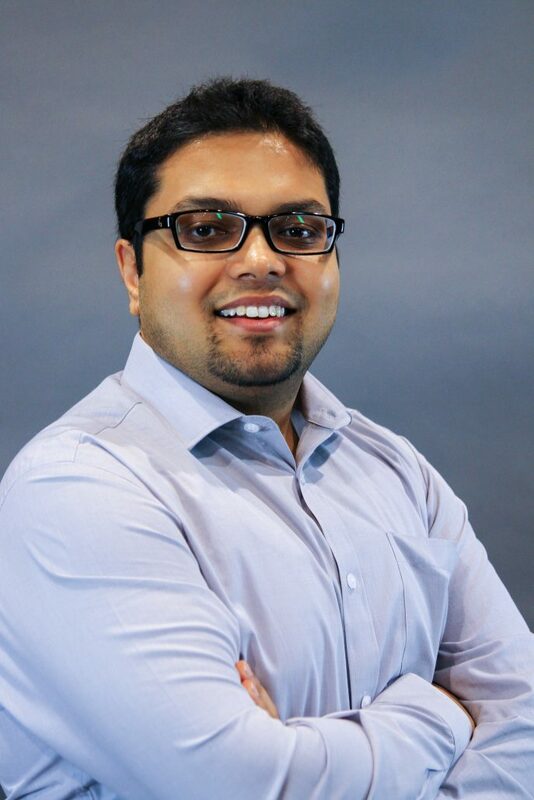 Hi, Rahim – please tell us a little about your background and why you chose to create your own website! I started my website to be vocal about the plethora of issues scientists go through in their PhD life starting from selecting an advisor to getting ready for the next phase. I wanted to share the unique opportunity KAUST (King Abdullah University of Science & Technology) brings to the PhD student. When people first hear a university in Saudi Arabia, the reaction, in general, is not quite positive. KAUST brings lots of researchers during the year, and the enrichment programs are remarkable. I created my own website in order to promulgate my thoughts without any restriction. I wanted to share my experience in GIKI, KAIST, and KAUST. I also wanted to promote my research activities. In a research paper, you have to follow the specific format and informal language is not accepted. However, if you really want to impact the masses, you need to leave the coat of jargons and wear the v-neck of a common language. In a nutshell, I created the website for my own freedom of speech and to share my insights with the global community. Your legacy is not what you have achieved; you legacy is how many lives you have impacted. What do you gain from having a website during a normal working week? Interactive conversations. When I post a blog, article or promotion of my upcoming talk, people in my university discuss the post with me. Many of the ideas which I discuss in my talks are the result of these interactive conversations I experience. Invitations to events which are exclusive to few people who would like to be covered on my website. Invitations to attend interactive sessions with CEOs visiting campus. Healthy relations. My relations with many people has been amazing because either I wrote about their event, research paper, conference or the event they organize. What was easier and what was harder than you had expected? Website making was really easier than I anticipated. There is a perception that only coders can make a website and maintaining it would be highly expensive. The first website I developed was for the Salon which is owned by my mother. My friend Shaan Khan taught me how to use Joomla and from there point on I started to experiment with other blogging platforms. I do not know ‘ABC’ of the coding, but in just a couple of hours, I was using basic WordPress which is enough to create your own interactive website. It is that simple. 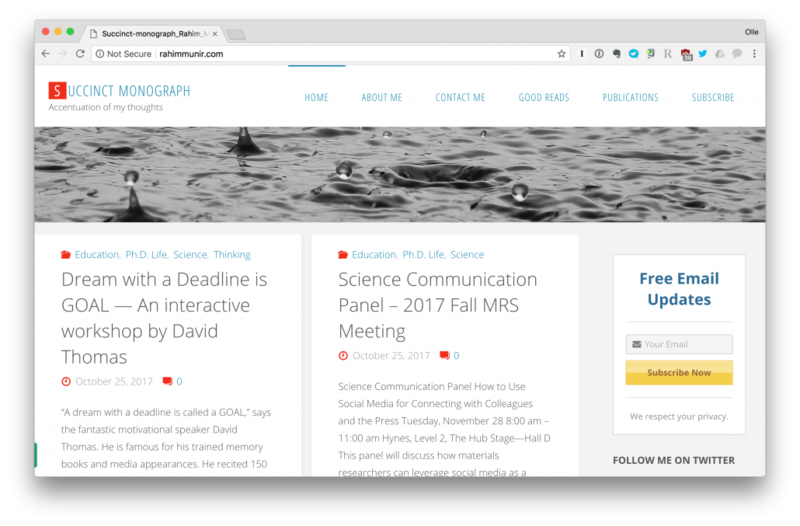 I got the idea to create my own website where I could share my research experience. Since it is easy to make and affordable to make; I decided to keep it perpetually. I found out saying ‘No’ is harder than I expected. When I am occupied with other commitments and receive an invitation to an event or a guest article or an editorial, I have to say No. I do not want to compromise the quality of my writing because of overburdening my plate. In some cases, people understand the situation, but in some cases, people were not happy. Do you think that all scientists should follow your example? Please motivate your reply. I believe that every scientist should create their own creative website. Having your own website gives you the liberty to express your self without the limitation of the formal linguistics. You can share comments on the article you just read, share the experience of the conference you just attended and promote your own research. There are hundreds of thousands research articles published in a year. Mostly researchers search the web through keywords. Your website presence will highlight your research on the search engine, and you will get more recognition in terms of citations. Moreover, if you are applying for a job after PhD or postdoctoral fellowship, having a website with your portfolio gives you enough space to show your talents. CVs are getting old. LinkedIn has taken over the CVs. However, every social media platform has its own restriction. Your employer only needs an internet connection to find you through your website rather than signing up for the social media. Having your own voice in your own way is crucial. Give three pieces of advice to the early career scientist who wants to create a personal website! Learn to use WordPress, Joomla, or Blogger, whichever platform you like. Get use to the working environment through an enormous amount of tutorials available on the internet. Create a free version of your blog and if you feel you are ready, you can purchase your own domain name. It is not necessary to have your own domain, having a voice IS. Start writing and making videos. Write 10 minutes a day on your website. It will improve your writing skills as well as content on your website. It will start to wire your brain for immaculate writing. However, you do not want your website to be text-based Interview, formally or informally, the colleagues around you and share the video on your website. There are plenty of freeware available for video editing. You may create video abstracts for your research as well. Write about any event you attend. As a scientist, you may attend research seminars, leadership talks, or conferences. After the talk, go to the speaker(s) and take the picture with them and tell them that you will write about their talk. It is a great way of networking. I belong to the southern city of Pakistan (Karachi), which is the financial capital of the country. I moved to Northern Pakistan (Ghulam Ishaq Khan Institute of Science & Technology, GIKI), where the language and culture are completely different, for engineering studies. From there I moved to South Korea (Korea Advanced Institute of Science & Technology, KAIST) for pursuing Master’s degree again the language and culture were completely different. I moved to Saudi Arabia (King Abdullah University of Science & Technology, KAUST) for pursuing PhD degree in Materials Science & Engineering. Science, philosophy and communication are interwoven in the fabric of my personality. As an undergrad, I used to give talks about communication and leadership skills. I use to miss that mass public outreach during my Masters and PhD.